If you’re tired of eating the same variations of food over and over again, it’s probably time to switch things up in the kitchen. Instead of making your usual recipes, why not try banana bread French toast or a green bean casserole pizza? With the help of Natalie Slater, you can turn traditional recipes into recipes that are new and exciting. Natalie Slater, creator of the popular BakeandDestroy.com, is daring you to step out of your comfort zone and take food to the next level. In her first cookbook, Bake and Destroy: Good Food for Bad Vegans, Slater puts mac and cheese in a sandwich, turns falafel into waffles, and tops nachos on cupcakes. There’s a good chance that you haven’t tried anything like these before, and you’ll be in for a big surprise. You won’t ever want to go back to your “normal” recipe routine again. Not only are Slater’s recipes 100% vegan and delicious, but each recipe is beautifully photographed and begs you to get in the kitchen and try the unique recipes for yourself. Whether you’re a vegan or not, you’ll find that each recipe uses simple ingredients and is easy to make. Being different doesn’t mean you have to go out and buy all new ingredients; it’s just a matter of mixing up what you already have. For example, Slater’s “Green Bean Casserole Pizza” is an absolute must! Who doesn’t like green bean casserole or pizza? Or what about nachos or muffins? Combine the two and you’ll get Slater’s “Nacho Cupcakes” recipe which are perfect for any party you plan to throw. Thanks to Slater, you can show your guests that being vegan has nothing to do with being boring. Other great recipes to try include the “Bike Messenger Brownies,” “Honky Tonk French Toast,” “Candy Bar Smoothie,” “Taco Lasagna,” plus many more! You’ll want to try each and every recipe in the book. Slater proves that vegans don’t have to be good all of the time. 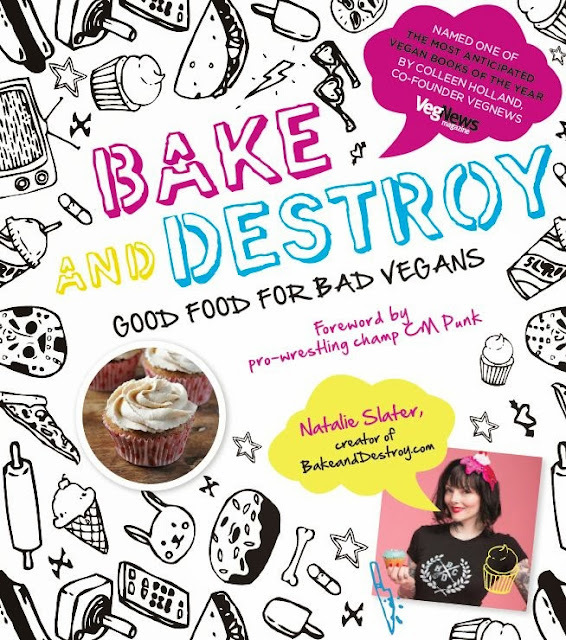 Purchase your copy of Slater’s Bake and Destroy—you’ll love her good food for bad vegans!